A Type 1 error is committed if we reject the null hypothesis when it is true. A Type 2 error is committed if we accept the null hypothesis when it is false. Type S errors occur when you claim that an effect is positive even though it’s actually negative. Type M errors occur when you claim that an effect is large when it’s really small (or vice versa). You’re probably thinking to yourself, “Why should I care about Type S or Type M errors? Surely if I do a typical null hypothesis test and reject the null hypothesis, I won’t make a Type S error, right?”1 Wrong! More precisely, you’re wrong if your sample size is small, and your data are noisy. If you are studying effects where between group differences are small relative to within group variation, you need a large sample to be confident in the sign of any effect you detect, even if the effect is statistically significant. 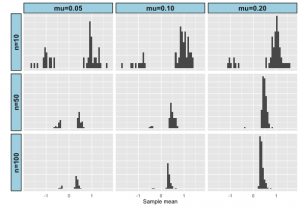 The figure below illustrates results for 1000 replicates drawn from two different populations with the specified difference in means and sample sizes. Source code (in R) to replicate the results and explore different combinations of sample size and mean difference is available in Github: https://github.com/kholsinger/noisy-data. [W]e believe that too many small studies are done and preferentially published when “significant.” There is a common misconception that if you happen to obtain statistical significance with low power, then you have achieved a particularly impressive feat, obtaining scientific success under difficult conditions. Bottom line: Be wary of results from studies with small sample sizes, even if the effects are statistically significant. 1I’m not going to talk about Type M errors, because in my work I’m usually happy just determining whether or not a given effect is positive and less worried about whether it’s big or small. If you’re worried about Type M errors, read the paper by Gelman and Tuerlinckx (PDF). I recently learned of a new website that is worth putting in your bookmark list or adding to the subscription list of your RSS reader: Letters from graduate school. Here’s what they say about themselves. Writing on an island, by Becky Vartabedian, which describes a physical practice that helped her find her way out of the isolation that is an inevitable part of doctoral study. Post-PhD: the jobs didn’t get and the one that I did, by A. Seun Ajiboye, which talks about how he found what profession he wanted in (and how he got there) after realizing that he didn’t want to be in academia. If Issue 1 is any indication, Letters from Graduate School will be a valuable resource for graduate students and graduate advisors. I look forward to reading the essays in future issues. There has always been a digital swap meet called eBay. There have always been Cadillac Escalades. West Nile has always been a virus found in the US. Vaccines have always erroneously been linked to autism. They have no memory of Bob Dole promoting Viagra. 100 years ago today the National Park Service was born. National parks are, as the Ken Burns documentary put it, America’s Best Idea. Unfortunately, I will not be able to participate in any of the celebrations today, nor am I likely to make it to a National Park this year, but I am delighted to live in a country that has placed such value on wild and beautiful places. I practically grew up in Yellowstone, and I’ve visited many other National Parks. Please take some time today to celebrate our good fortune, and if you’re close enough to a National Park or National Monument to visit, please consider taking the time to stop by and thank the Park Service employees for their service to our country. To what extent is public communication of scholarly work an aspect of scholarly achievement? Should public communication be regarded primarily as service in the tenure triad of teaching, research, and service? Is public communication worthwhile only if it leads to changes in public policy or professional practice? Is it worthwhile if it leads “only” to greater aesthetic appreciation of the human or natural world? The University of Connecticut has been recognized as a “Community Engaged” campus by the Carnegie Foundation for the Advancement of Teaching since 2010 (ref). These are clearly among the questions that we need to answer. Genetic clustering algorithms, implemented in popular programs such as STRUCTURE and ADMIXTURE, have been used extensively in the characterisation of individuals and populations based on genetic data. A successful example is reconstruction of the genetic history of African Americans who are a product of recent admixture between highly differentiated populations. Histories can also be reconstructed using the same procedure for groups which do not have admixture in their recent history, where recent genetic drift is strong or that deviate in other ways from the underlying inference model. Unfortunately, such histories can be misleading. We have implemented an approach (available at www.paintmychromsomes.com) to assessing the goodness of fit of the model using the ancestry ‘palettes’ estimated by CHROMOPAINTER and apply it to both simulated and real examples. Combining these complementary analyses with additional methods that are designed to test specific hypothesis allows a richer and more robust analysis of recent demographic history based on genetic data. A key observation Falush and his co-authors make is that different demographic scenarios can lead to the same STRUCTURE diagram. They illustrate three different scenarios. In all of them, they simulate data from 12 populations but sample from only four of them. In all of the scenarios, population P4 has been isolated from the other three populations in the sample for a long time. It’s the relationship between P1, P2, and P3 that differs among the scenarios. Recent admixture: P1 and P3 have also been distinct for some time, and P2 is a recent admixture of P1, P3, and P4. Ghost admixture: P1 and P3 diverged some time ago, and P2 is a recent admixture of P1 and a “ghost” population more closely related to P3 than to P1. Recent bottleneck: P1 is sister to P2 but underwent a strong recent bottleneck. The authors also refer to Puechmaille’s recent work demonstrating that estimates of genetic structure are greatly affected by sample size. 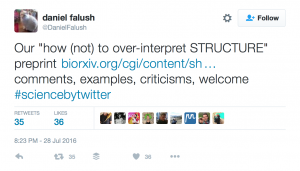 Bottom line: Read both this paper and Puechmaille’s if you use STRUCTURE, tread cautiously when interpreting results, and don’t expend too much effort trying to estimate the “right” K.
1OK, as you can see from the tweet, it was almost a month ago. San Miguel Island, Santa Rosa Island, Santa Cruz Island, and Santa Catalina Island are each home to a subspecies of Urocyon littoralis, a small fox about the size of a house cat. The species was included as one of a number of species for which endangered species listing was “possibly appropriate” in 1982 (http://ecos.fws.gov/docs/federal_register/fr650.pdf). By 2000, there were only 15 individuals on San Miguel, 15 on Santa Rosa, and 55 on Santa Cruz, and the four subspecies were listed as endangered on March 5, 2004. 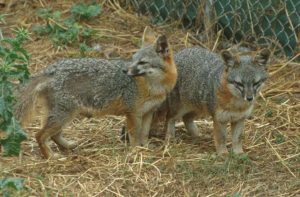 On September 12, only a little more than 12 years after they were listed, the fox subspecies on San Miguel, Santa Rosa, and Santa Cruz will be removed from the endangered species list and the subspecies on Santa Catalina will be reclassified as threatened (https://www.gpo.gov/fdsys/pkg/FR-2016-08-12/pdf/2016-18778.pdf). There are now between 700 and 2100 individuals on the islands where subspecies are being removed from the list. Foxes on Santa Catalina Island — a tourist destination — also are recovering but not as fast as their counterparts on the northern Channel Islands. Their numbers plummeted in the 1990s after an outbreak of canine distemper, presumably brought over from the mainland. It’s not often we have good news about endangered species. My thanks and congratulations go out to everyone involved in bringing these animals back from the brink of extinction. 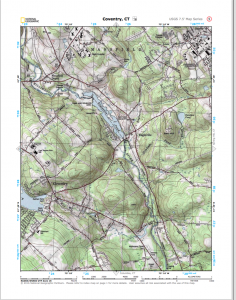 National Geographic has made available nearly all of the topographic quadrangle maps from the US Geological Survey as PDF download. I use regularly use a GPS when I’m in unfamiliar territory, but it is even better to have a topographic map to refer to. I’m delighted to have found this resource. Paul Stern and colleagues1 use the term “neoskepticism” to describe the view that although climate change is real and although humans are responsible for much of it, the costs of attempting to reduce or mitigate it exceed the benefits. [N]eoskepticism accepts the existence of [anthropogenic climate change] but advocates against urgent mitigation efforts on various grounds, such as that climate models run “too hot” or are too uncertain to justify anything other than “no-regrets” policies as having net benefits. Mainstream climate scientists are well aware of uncertainty in climate projections. But neoskeptics’ citing of it to justify policy inaction marks a shift of focus in climate debates from the existence of ACC to its import and to response options. The problem, of course, is that uncertainty is a double-edged sword. It’s possible that the impacts of climate change won’t be as bad as current (mean) projections, but it’s also possible that they will be far worse. Worse yet, the longer we wait to mitigate impacts, the more difficult and expensive it will be to prevent them. In response, they argue both for more attention to decision sciences and to the science of science communication. Both are certainly needed. But they also focus only on part of the science communication that’s needed, the part having to do with facts about costs, benefits, and risks of action or inaction. As scientists, we pay too little attention to the emotional aspects of persuasion involved in guiding public policy, and here I’m not talking about appeals to “your children and grandchildren” or “our fellow creatures.” I’m talking about the emotions people feel when they think about scientists in particular or experts more generally, for example. Science communication is important even when it isn’t imparting facts or knowledge. In fact, it may be even more important when it’s not imparting facts or knowledge. It may be most important when it’s sharing scientists as caring human beings who can be trusted. Only if we are trusted will anyone listen when we share our insights with them. Kudos is more than a just a networking site, and more than just a publication listing. It is a toolkit for explaining your work in plain language and for enriching it with links to related materials (watch a video about explaining and enriching). Kudos also provides a unique one-stop shop for multiple metrics relating to your publications: page views, citations, full text downloads and altmetrics. When you explain, enrich and share your work through Kudos, we map your actions against these metrics in charts that show you which activities are most effective when it comes to increasing the reach and impact of your work (watch a video about sharing your work). The site is free for academics because scholarly institutions, societies, publishers and other commercial clients pay for its upkeep. Kudos helps these customers to track and evaluate their researchers (or, in the case of publishers, their authors) and foster a stronger relationship with them, explains Rapple. By encouraging researchers to do outreach, the site also indirectly builds the profile of their institution or their journal, she adds. And Rapple hopes that publishers and institutions can build up valuable intelligence from the Kudos database about the effects of different kinds of outreach. The site has established partnerships with some 65 publishers so far, including well-known firms such as Wiley and Taylor & Francis. I’m going to try register soon. I’ll keep you posted on what I find.